It’s no secret that there aren’t enough neurologists to go around—and the shortage is only expected to get worse. The national shortfall of neurologists is anticipated to rise from 11% in 2012 to 19% in 2025.1 For our patients, this means that the already long wait times to see a neurologist in the US, currently averaging > 4 weeks for adult neurology1,2 and > 8 weeks for child neurology,1,3 are only going to get longer. During these long wait times for an appointment, patients may suffer strokes, seizures, or other disease exacerbations that could have been prevented or minimized. How do we fix this? How can we improve access to our specialty? Innovative solutions have recently been piloted with some success, including employing physician extenders,4 adjusting clinic workflow,5 and using telemedicine.6 These solutions will only take us so far; we need more neurologists. We need more than 2% of US graduates to match into adult or child neurology.7 The opportunities are there.The number of neurology residency positions is increasing substantially, with adult neurology PGY1 positions up 25% from 2016 to 2018 and child neurology PGY1 positions up 16% over that same period.7 International medical graduates (IMGs), who filled 47% of adult neurology and 21% of child neurology PGY1 residency positions in 2018, may make up for some of the low interest among US medical students.7 But even though the majority of IMGs in neurology residencies may want to stay in the US—79% of those without a Green Card in one study8—the remainder will likely leave, and stricter immigration laws may limit entry of IMGs into the US neurology workforce. For now, let’s focus on increasing the 2%. We know that not all medical students are destined for neurology, and that’s okay. We’re not going to recruit the budding surgeon who has dreamed since elementary school of perfecting the next Whipple procedure. But there does seem to be an increasing interest in neuroscience among US undergraduates; neuroscience is growing as a popular college major.9 So how do we capitalize on this trend among undergraduates and recruit more medical students with a potential interest to join our field? What Drives the Choice of Neurology or Not Neurology? Targeting these factors with early, integrated neuroscience curricula and formal mentorship programs, beginning in the first year of medical school, is likely our best hope. The basic neuroscience course is anecdotally the most feared course among medical students. We have an excellent opportunity in this initial course to ease the students’ heightened sympathetic response, which would allow them to digest the material and approach the field in a more positive light from the get-go. We need to structure the course in an organized, easy-to-follow manner, focusing on clinically relevant material. We don’t need to scare students off with cross-sectional brainstem anatomy on the first day of class. To engage today’s medical student, we must also keep up with the times. This is the time of social media, which has opened the door to many free open-access medical education tools, including podcasts, YouTube videos, Twitter discussions, blog posts, live journal clubs, and online communities.27 Neuroscience education is beginning to enter the social media scene,28,29 although perhaps on the later side. Even as an aspiring medical educator, I personally have been reticent to enter the social media world for medical education, in part due to concerns over professionalism and privacy, and also due to time constraints. But, with judicious use of the platforms to address the first two concerns, I think the time investment will be well worth it. We then need to work on the integration of basic science and clinical neurology. The lack of such integration is what Dr. Józefowicz described as the basis for neurophobia.20 The American Academy of Neurology (AAN) has similarly recognized the need for integration, and the Undergraduate Education Subcommittee (UES) of the AAN outlined a longitudinal competency-based neuroscience curriculum including both preclinical and clinical coursework.30 Problem-based learning methods may also improve such integration by including clinical cases in neuroscience courses. But this isn’t enough. Students should learn the neurologic examination early on, and soon after, apply those skills by examining patients with neurologic diseases, ideally at the same time as they are taking their basic neuroscience course. After a morning session of problem-based learning on the basal ganglia, for example, how wonderful would it be for students to examine a patient with Parkinson’s disease in the afternoon? The integration should also occur in the neurology clerkship, with students revisiting basic neuroscience principles. This could be accomplished via weekly conferences during the clerkship. I strongly support what is termed planned redundancy in this setting, with planned being the key word. For example, let’s bring back the basal ganglia video and problem-based learning case of Parkinson’s disease, after some of the students have seen a patient with Parkinson’s disease, or at least another movement disorder, in clinic. I would remind the students that they had seen the material before. Revisiting the material may trigger memories of earlier concepts, and the discussion would likely be enhanced by students’ personal experiences with similar cases. Because the students should be able to work through the case more quickly this time around, there would be time to build on the case. This time, for example, I would add an additional section on the patient’s treatment options. Aside from effective, integrated neuroscience courses, an emphasis on early exposure to patients, disease processes, and neurologists is important for recruitment. Clinical integration into the basic neuroscience course will help, but we also need to advocate for early, and ideally required, clerkship exposure. In a survey of US clerkship directors in 2012, neurology was a required clerkship at 93% of responding institutions.32 However, only 56% had neurology clerkships that had to be taken in the third year. This is an increase from 45% in 2005 but is still too low.32 Many students may not have sufficient clinical neurology exposure to fully consider pursuing neurology before residency applications are due. Mentorship is another key factor for recruitment. We can learn from Zuzuarregui and Hohler, who implemented a successful 1:1 mentoring program at Boston University, initially with third-year medical students and later expanded to medical students across all years. The program included career mentoring and guidance in clinical research.18 After implementation of this program, the number of Boston University medical students pursuing neurology rose from 3 in 2006 to 9 in 2014.18 Perhaps a national effort to improve mentorship through existing infrastructure such as the Student Interest Group in Neurology would yield similar results. An important way that clinical exposure and mentorship can increase medical student interest in neurology is by providing role models to refute false stereotypes. In a study of primary care career choice, role models were particularly important in disproving negative stereotypes.13 In neurology, we need to show students that we’re not just “armchair intellectuals” with a “diagnose and adios” mentality. We can expose students to the many ways we treat patients. In the inpatient setting, let’s remember to share our excitement when we respond to a stroke page and are able to administer intravenous tissue plasminogen activator or coordinate mechanical thrombectomy and see our patients get better. In the outpatient setting, let’s celebrate with the students when we see a child with spinal muscular atrophy type 1 back in clinic sitting unsupported after receiving the medication nusinersen. Let’s coordinate journal clubs to review the evidence for the new monoclonal antibodies against calcitonin gene-related peptide to treat migraine, or the new antisense oligonucleotides to treat Huntington’s disease. Let’s remind the students that we need more neurologists to treat these patients and to participate in the research that makes these interventions possible. Just as importantly, let’s teach the students that there is much more to treating a patient than curing a disease. Even when a cure or disease-modifying treatment is not available, we can still reduce suffering, ease pain, and improve quality of life. We can make just as much of a difference in the lives of these patients, if not more. In our problem-based learning discussions of Parkinson’s disease and Huntington’s disease, let’s discuss that although we cannot cure these diseases yet, we do have symptomatic therapies, and the doctor-patient relationship in and of itself can be incredibly therapeutic and rewarding to both the patient and clinician. As someone who came to medical school thinking I was going into dermatology, I’m certainly glad I had early, exceptional neuroscience teaching and wonderful mentors in child neurology to lead me down the path that is right for me. I hope to do the same for others. If you have suggestions for a Twitter handle, please let me know. 1. Dall TM, Storm M V, Chakrabarti R, et al. Supply and demand analysis of the current and future US neurology workforce. Neurology. 2013;81(5):470-478. 2. Hayhurst C. The doctor will see you... sometime. Athena Health. https://www.athenahealth.com/insight/sites/insight/files/12.11 The doctor will see you ... sometime.pdf. Published 2017. Accessed July 4, 2018. 3. Pediatric specialist physician shortages affect access to care. Children’s Hospital Association. https://www.childrenshospitals.org/issues-and-advocacy/graduate-medical-education/fact-sheets/2012/pediatric-specialist-physician-shortages-affect-access-to-care. Published 2012. Accessed July 4, 2018. 4. Ross SC. 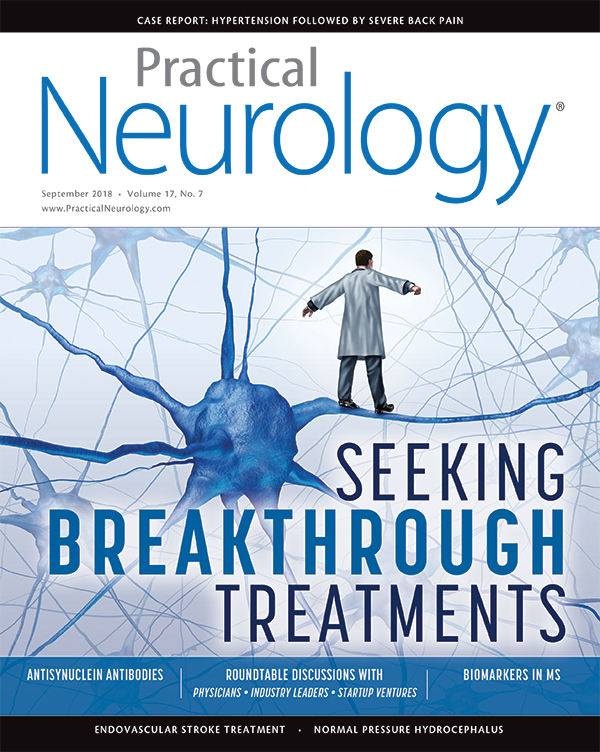 An option for improving access to outpatient general neurology. Neurol Clin Pract. 2014;4(5):435-440. 5. Goodridge A, Woodhouse D, Barbour J. Improving patient access at a movement disorder clinic by participating in a Process Improvement Program. BMJ Qual Improv Rep. 2013;2(1):u479.w1007. 6. Duncan C, Dorrian C, Crowley P, Coleman R, Patterson V. Safety and effectiveness of telemedicine for neurology outpatients. Scott Med J. 2010;55(1):3-5. 7. National Resident Matching Program. Results and Data: 2018 Main Residency Match®. Washington, DC; 2018. 8. Freeman WD, Nolte CM, Matthews BR, Coleman M, Corboy JR. Results of the American Academy of Neurology Resident Survey. Neurology. 2011;76(13):e61-e67. 9. Ramos RL, Esposito AW, O’Malley S, Smith PT, Grisham W. Undergraduate neuroscience education in the U.S.: quantitative comparisons of programs and graduates in the broader context of undergraduate life sciences education. J Undergrad Neurosci Educ. 2016;15(1):A1-A4. 10. Querido SJ, Vergouw D, Wigersma L, et al. Dynamics of career choice among students in undergraduate medical courses. A BEME systematic review: BEME Guide No. 33. Med Teach. 2016;38(1):18-29. 11. Abdulrahman M, Makki M, Shaaban S, et al. Specialty preferences and motivating factors: a national survey on medical students from five UAE medical schools. Educ Health (Abingdon). 2016. 29(3):231-243. 12. Takeda Y, Morio K, Snell L, Otaki J, Takahashi M, Kai I. Characteristic profiles among students and junior doctors with specific career preferences. BMC Med Educ. 2013;13(1):125. 13. Burack JH, Irby DM, Carline JD, Ambrozy DM, Ellsbury KE, Stritter FT. A study of medical students’ specialty-choice pathways: trying on possible selves. Acad Med. 1997;72(6):534-541. 14. Kamour AH, Han DY, Mannino DM, Hessler AB, Kedar S. Factors that impact medical student and house-staff career interest in brain related specialties. J Neurol Sci. 2016;369:312-317. 15. Albert DV, Yin H, Amidei C, Dixit KS, Brorson JR, Lukas R V. Structure of neuroscience clerkships in medical schools and matching in neuromedicine. Neurology. 2015;85(2):172-176. 16. Gupta NB, Khadilkar SV, Bangar SS, Patil TR, Chaudhari CR. Neurology as career option among postgraduate medical students. Ann Indian Acad Neurol. 2013;16(4):478-482. 17. Stafstrom CE. How to attract students to child neurology. Pediatr Neurol. 2004;31(4):308; author reply 308-309. 18. Zuzuarregui JRP, Hohler AD. Comprehensive opportunities for research and teaching experience (CORTEX): a mentorship program. Neurology. 2015;84(23):2372-2376. 19. Albert DV, Hoyle C, Yin H, McCoyd M, Lukas RV. Why neurology? 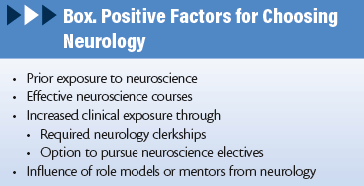 Factors which influence career choice in neurology. Neurol Res. 2016;38(1):10-14. 20. Jozefowicz RF. Neurophobia: The fear of neurology among medical students. Arch Neurol. 1994;51(4):328-329. 21. Zinchuk AV, Flanagan EP, Tubridy NJ, Miller WA, McCullough LD. Attitudes of US medical trainees towards neurology education: “Neurophobia”—a global issue. BMC Med Educ. 2010;10(1):49. 22. Schon F, Hart P, Fernandez C. Is clinical neurology really so difficult? J Neurol Neurosurg Psychiatry. 2002;72(5):557-559. 23. Abulaban AA, Obeid TH, Algahtani HA, et al. Neurophobia among medical students. Neurosciences. 2015;20(1):37-40. 24. Sharma N, Lau CS, Doherty I, Harbutt D. How we flipped the medical classroom. Med Teach. 2015;37(4):327-330. 25. Imanieh MH, Dehghani SM, Sobhani AR, Haghighat M. Evaluation of problem-based learning in medical students’ education. J Adv Med Educ Prof. 2014;2(1):1-5. 26. Chen K-S, Monrouxe L, Lu Y-H, et al. Academic outcomes of flipped classroom learning: a meta-analysis. Med Educ. 2018:June 25. doi:10.1111/medu.13616. 27. Colbert GB, Topf J, Jhaveri KD, et al. The social media revolution in nephrology education. Kidney Int Rep. 2018;3(3):519-529. 28. Hennessy CM, Kirkpatrick E, Smith CF, Border S. Social media and anatomy education: using twitter to enhance the student learning experience in anatomy. Anat Sci Educ. 2016;9(6):505-515. 29. Nix JS, Gardner JM, Costa F, et al. Neuropathology education using social media. J Neuropathol Exp Neurol. 2018;77(6):454-460. 30. Merlin LR, Horak HA, Milligan TA, Kraakevik JA, Ali II. A competency-based longitudinal core curriculum in medical neuroscience. Neurology. 2014;83(5):456-462. 31. Holden KR, Cooper SL, Wong JG. Neuroscience curriculum changes and outcomes: medical university of South Carolina, 2006 to 2010. Neurologist. 2012;18(4):190-195. 32. Carter JL, Ali II, Isaacson RS, et al. Status of neurology medical school education: results of 2005 and 2012 clerkship director survey. Neurology. 2014;83(19):1761-1766.